Welcome to the Bond Street Association’s AGM & lunch, an event that I particularly enjoy each year, as it is such an excellent opportunity to see our members and to update you on all the activity of the BSA over the past year and our plans for next year. It is also a great opportunity to chat and network with Bond Street colleagues, friends, and neighbours in this beautiful setting. I particularly want to thank Paul Jackson, the GM here at Claridge’s, not just for working with us to host this AGM, but also for his commitment to working with the BSA and joining our Council. 2016 has proved to be a challenging year, many of us are concerned about the economy following the Brexit vote and of course we have not seen the real outcome of that yet. It is encouraging that in the past few weeks there has been an uplift in visitor numbers, which many put down to overseas visitors taking advantage of the weak pound, and while London is one of the most popular visitor destinations in the world, we need to work hard to ensure that London retail and particularly Bond Street remain the worldwide attraction they are today. The £10m investment in Bond Street’s public realm is set to commence in 2017 spearheaded by NWEC and Westminster City Council. This work is key to ensuring Bond Street’s future as a world-leading shopping destination. We have seen Bond Street fall behind our neighbouring streets over recent years, as Grosvenor and The Crown Estate invest into Mount Street and Regent Street, so I am delighted that the funds have now been raised and the much needed public realm upgrade for Bond Street can begin. – This is something the BSA has been very instrumental in, and I am particularly proud of instigating with my team. This street improvement work, together with the Crossrail project and the opening of the Elizabeth Line, will bring an additional 60m visitors to the West End annually, boosting retail sales by £10bn a year. I am delighted to be part of the Bond Street Development Group, headed by Paul Dimond, Chairman of DAKS, collaborating with NWEC, Westminster City Council, The Mayor of London, the Metropolitan police, and other organisations to help create a thriving, safe and unrivalled luxury shopping destination. I am often asked what the BSA does! So I will as quickly as possible tell you! We are about connectivity, working with your neighbours, partners, and like-minded organisations to bring improvement, collaborations, and progression, and of course being a thorn in the side of inertia. Now in its 92nd year, the Bond Street Association offers its Members a host of opportunities including PR & marketing, brand collaborations, professional seminars, workshops, social networking events, training and development, as well as links to Westminster City Council and other governing bodies. The official Bond Street website attracts between 20,000 – 30,000 thousand visits per month and is supported by our growing social media platforms. We have an on-going media partnership with the Mayfair Magazine, which sees BSA Members receiving preferential advertising rates as well as being listed in the magazine’s two annual Mandarin and Arabic issues. I also sit on the judging panel for the Mayfair Awards, which celebrate excellence across businesses in Mayfair. Bond Street News, our consumer newsletter, edited by the luxury journalist, Lucie Muir continues to draw people to the street. This year we have interviewed many famous Bond Street personalities and celebrities who shop our street. If you don’t receive this, please let us know, as it really is fun and informative. We continue to bring VIP shopping groups to Bond Street through the Bond Bespoke program, connecting with travel companies, Concierge groups, hotels, and businesses. This year’s groups have included; Morgan Stanley, University Alumni groups, a group of international F1 followers, as well as tour groups from Asia and America. We have just instigated an exciting new partnership with Moët Hennessy, giving our Members preferential rates on purchases as well as access to their exclusive events and experiences. We will be revealing more on this partnership over the next few months. In June we celebrated Her Majesty The Queen’s 90th birthday with a special publication entitled A Royal Life, acknowledging Bond Street’s contribution to the Royal household via the many Royal Warrant holders and suppliers to the Royal family. The BSA supported Brown’s London Art Weekend in July, a fantastic initiative – now in its third year – in which leading galleries and auction houses across Mayfair and St James’s open their doors to a weekend of tours, talks, walks and VIP parties. The event brings opportunities for innovative collaborations between galleries and retailers such as La Perla’s unique tour and Gallery Hop party for 200 young collectors. Over the year Members were invited to business forums focused on Fraud & Theft Prevention, Retailing in a Multi-Channel World, and most recently The Art of Luxury Service in partnership with Debrett’s Academy. The Bond Street Association’s diary of social events are always well attended and are an enjoyable way to network. From sales previews, Cheese & Wine Pairings with Berry Bros & Rudd, a performance of Shakespeare in the St James’s Square, to jazz and salsa dance nights at 100 Wardour St and Quaglino’s, and of course our annual Quiz Night. Remember to add December 14th to your diaries for the final event of the year, the Three Associations Carol Service at St James’s Church on Piccadilly, which is a wonderfully festive end to the year. I would like to thank the Bond Street Association Council who in attending our meetings give their valued time, ideas and opinions. My particular thanks go to Sophie Grounds for her amazing contribution to the BSA’s involvement in Brown’s London Art Weekend. Sophie, you have been a hugely valued member of the Council for many years, and we all wish you the greatest of happiness for the birth of your first child. I would also like to give a special thank you to the Directors of the BSA who attend very regular meetings and ensure that the BSA continues all its great work, my thanks to Pauline Hudson-Evans, Simon Fitzpatrick, and Alex Bergholz-Gander and of course to Katie Thomas who is responsible for all our PR, Marketing, and Communication activities. The Bond Street Association is an important voice for the retailers and businesses in and around Bond Street, working with the NWEC and Westminster City Council to ensure your needs and expectations are met. We can only continue to represent and support you if you support us through your annual subscription and an on-going engagement with us. On that note, may I wish you all a very successful Christmas trading period and very much look forward to working with you in 2017. Nicola Gerber Maramotti glides into Max Mara’s Old Bond Street flagship looking as cool as a cucumber on what is officially the hottest September day since 1911. Immaculately dressed in a white trouser suit, white silk T-shirt and white platforms, it’s hard to believe that she has just braved the London Underground – the heaving Central Line no less. Anyone else might have thought she had descended from the heavens on a fluffy white cloud. Today, German-born Nicola keeps tabs on the company’s 300 plus stores across Europe. Her involvement in the company began soon after she married Ignazio Maramotti in 1993. His father Achille Maramotti founded the brand in 1951 and is widely credited with introducing ready-to-wear to Italy. Nicola’s dedication to educating retail staff and ensuring warm and inviting retail spaces is clear to see in Max Mara’s Old Bond Street store. Recently revamped and expanded, it boasts an upstairs garden terrace – a rare find amongst Mayfair’s urban sprawl. Every little detail is Nicola’s doing, right down to the dressing room lights. “Women want to look pretty in the changing room,” she says adding that it took 20 meetings with her designer team to create the most flattering light. Here, as in every Max Mara store, staff are well versed in the brand’s heritage and know the collections inside out – right down to the cut, stitch and fabric composition. Max Mara’s new e-learning programme, in which all employees are kept up to speed on such matters, and later tested and scored, can be thanked for that. Meanwhile, over at the company HQ in Reggio Emilia, the Max Mara Retail Academy attracts postgraduate students from around the world. As part of this intensive in-house training course, they spend one year in Italy and one year in one of the company’s European locations. When selecting students, Nicola instinctively knows if someone has a service-orientated mindset or not. “The job of retail manager is as much about psychology as it is numbers, and if you are not interested in people, then you can’t be in retail,” she notes. It is this investment in its workforce that makes Max Mara so unique – that and its ongoing commitment to empowering women, which starts with the clothes. The current autumn/winter 2016 collection pays homage to the 1920s Bauhaus and the women painters, textile designers, filmmakers and artists at its heart. Other hits include the ‘Whitney’ tote bag. Designed in collaboration with Italian architect Renzo Piano, its sumptuous geometric form is inspired by New York’s celebrated art museum. “It looks just like the Whitney,” she says with a smile, picking the shimmering bag up and swinging it lightly from her wrist. As a passionate advocate of championing women in the arts, Nicola also oversees the brand’s pioneering creative awards. The Max Mara Art Prize for Women in collaboration with London’s Whitechapel Gallery is the only visual art prize for women in the UK that aims to promote and nurture female artists. This year’s gong went to British artist Emma Hart. As part of her award, she will take up a six-month residency in Umbria and Lombardy, where she will create an artwork to be presented in major solo exhibitions at the Whitechapel Gallery in London and Collezione Maramotti in Reggio Emilia, Italy, next year. Support is also given to women in the male-dominated film industry. Since 2006, Max Mara’s Women In Film Face of the Future Award has been held in LA to annually honour outstanding women in the entertainment industry – women who lead by example, are creative, groundbreaking and excel at their chosen fields. In June, Nicola presented the 2016 award to Game of Thrones actress Natalie Dormer. Finally, I ask Nicola what she loves most about London and Bond Street. “Bond Street with its relaxed luxury vibe and glamour is unique. It attracts the best of the best – the best fashion, the best art, the best windows… And of course I love the tube!” she jokes before floating off in a white haze. Oliver Barker joined the celebrated international auction house in 1994 and moved to the Contemporary Art department in 2001, rising to the current post of Chairman, Sotheby’s Europe, Senior International Specialist. As a key figure on the rostrum, he oversees major auctions in both London and New York – some more memorable than others. In 2008 for example, on the same day as the Lehman Brothers collapse, he oversaw the market-defining sale of the contents of Damien Hirst’s restaurant Pharmacy. Recalling the auction Oliver said: “As the sale started it was clear we were definitely onto something… The sale had an estimate of around £3 million and it made £11 million with everything sold. Importantly, it established a bond of trust between Sotheby’s and Hirst.” Five years later, he brought works to auction directly from the artist’s studio for another landmark Hirst sale ‘Beautiful Inside My Head Forever’, which achieved £111.5 million and established a world record for a single-artist sale. Later, in 2015, Oliver set a new auction record for any work on paper by Frank Auerbach with an early portrait of his cousin Gerda, (Head of Gerda Boehm from 1961), which soared to £2.2 million. Most recently, he was responsible for bringing to auction Lucian Freud’s masterpiece Pregnant Girl which sold for £16.1 million against a pre-sale estimate of £7–10 million in February 2016. Meanwhile, Oliver, together with the ICA’s Gregor Muir, turns quizmaster at the much-loved Dover Street Arts Club annual arts quiz. The non-profit fundraiser is a memorable, often raucous affair, where international gallerists, museum directors, critics, curators and artists battle it out to prove they have the sharpest mind in the London art world. Next month, Sotheby’s London will stage a sale of David Bowie’s private art collection. The sale takes place in three parts on November 10th and 11th, encompassing some 400 items. At the heart of the sale is a remarkable group of more than 200 works from some of the most important British artists of the 20th Century, including Henry Moore and Graham Sutherland. I welcome guests from around the world to explore the art hanging in our galleries and they are always equally enthused to discover another of our hidden gems, the Sotheby’s Café. The café walls are hung with stunning photographs from the Cecil Beaton Studio Archive and we have a superb seasonal menu alongside a wine list curated by the incomparable Serena Sutcliffe, Honorary Chairman of Sotheby’s Wine. An ever present on the lunch menu is the lobster club sandwich – a favourite of our former chairman Alfred Taubman. I will never tire of walking through the beautiful spaces of The Royal Academy, just a stone’s throw from our own offices. You always get a sense of its incredible history, but it’s also an institution that continues to define the landscape of contemporary art; from the revolutionary “Sensation” show that introduced the YBAs to the world, to the current Abstract Expressionism show, staged under the visionary artistic direction of Tim Marlow. As an auctioneer, standing on the podium at the front of packed room, a perfectly tailored suit is an essential. Huntsman, on Savile Row, is an historic gentleman’s tailors, famed for crafting suits for the likes of Winston Churchill, Lawrence Olivier and the Royal Family. I love the bespoke experience you get when being fitted for a Huntsman suit and their classic, timeless look. The breakfast here is so special that it even inspired A.A Gill to write a book dedicated to the subject! The service and surroundings are impeccable – and it’s quite remarkable to think that Jeremy King and Chris Corbin opened the Wolseley as recently as 2003 as it has the feel of one of those great London institutions that has existed for decades. A Montblanc pen is an icon of European craftsmanship. The fact that the finest, handmade examples now appear in our auctions is testament to the esteem in which the brand is held among the world’s collectors. The style, quality and workmanship of Montblanc stationary is unmatched, so should they ever decide to create an auctioneers gavel it would be top of my list! In The Pearl Necklace, the latest coffee table tome from French art house publishers Maison Assouline, the history of pearls and, of course, the pearl necklace is traced through the story of Japanese pearl specialists, Mikimoto. Award winning journalist and jewellery historian Vivienne Becker has penned the forward, in which she reminds us why these rare sea treasures have long been the ultimate object of power, beauty and legend. And, numbering 300 pages, this coveted hardback, is also the most authoritative volume on the subject of pearls to date. Of course, nature’s precious white orbs remain very much in vogue. On the autumn/winter 2016 runways, Chanel, Gucci and Rag & Bone, to name but a few, accessorised looks with layers of pearl strands, single pearl earrings and lavish pearl headpieces. It just goes to show how far pearls have come since their regal image. 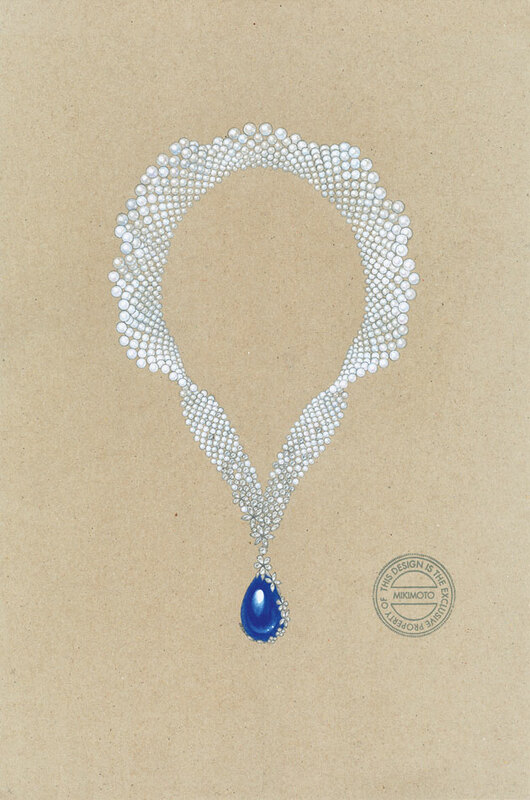 The book looks back at the history of Mikimoto and features stunning photos and illustrations from its archives. The cover shot, meanwhile, features strands of Mikimoto pearls draped on a model’s naked back. 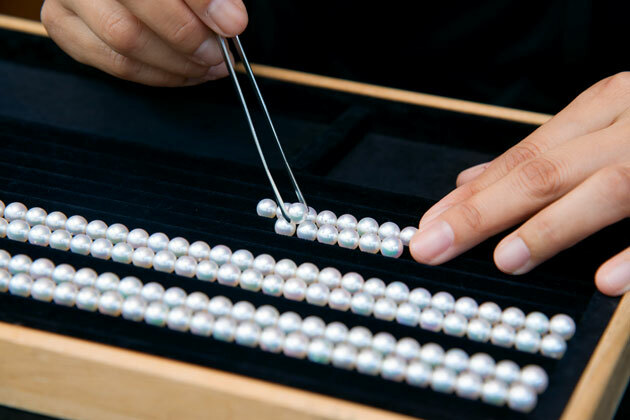 The brand’s founder, Kokichi Mikimoto, was the first to successfully culture a semi-spherical pearl in 1893. The method in which a tiny bead made of polished shell and a piece of mantle tissue is introduced by hand was so radical it even amazed the legendary inventor, Thomas Edison. And if there’s anything that links some of the world’s most famous women – from Her Majesty The Queen to Jacqueline Onassis, Grace Kelly and Michelle Obama – it has to be their pearls. The Pearl Necklace features rare portrait shots of some of the most celebrated pearl aficionados. We guarantee you’ll be digging out those pearly white heirlooms after reading it. In the whimsical world of fine fragrance, casting animals to portray a family of eccentric English aristocrats isn’t quite as barking as it sounds. British perfumer Penhaligon’s does just that in its new ‘Portraits Collection, Chapter 1’. In doing so, it creates a tale of love, mystery and intrigue around each fictitious character. One standout fragrance from this four-piece collection is the Coveted Duchess Rose (£178 for 75mls). 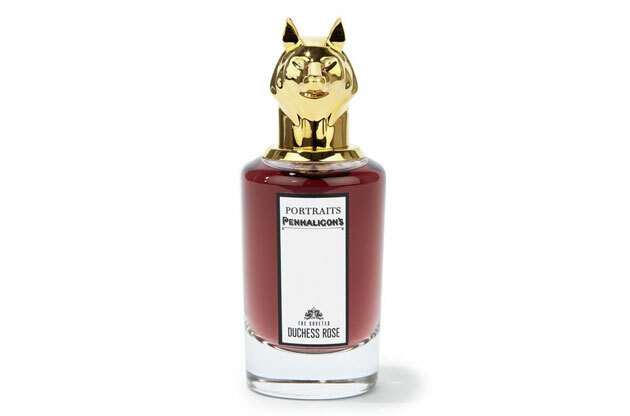 Topped with a fox head bottle stop and created by Penhaligon’s master perfumer Christophe Raynaud, this cunning blend of rose, mandarin and musky wood, is an autumnal delight.